At the moment, Instant Phaser Mk II is VST2 only. VST2 is known to have issues with sidechain in Cubase, as the method for sidechaining in the VST2-spec is a bit of a hack. I suspect that the other plugins you are using with sidechain are VST3 - please let me know if that is not the case. We are working on a VST3 version which will simplify/fix the issue - however I cannot as of now promise a release date. You are quite right about the VST3 status of the other plugins. As far as the workaround/hack that is far too much effort for such a simple thing, I am just going to approximate what I want with an automation curve for now. I appreciate your insight and expediant response. 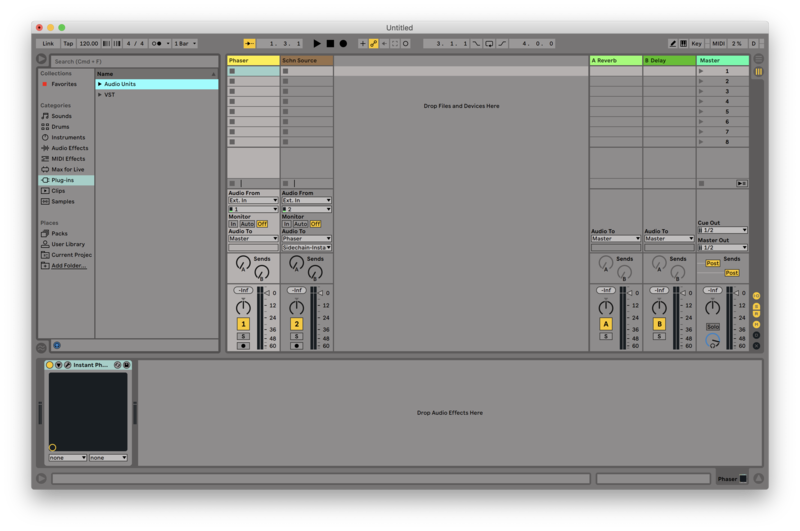 I have the same issue in Ableton Live 10 (64-bit), no option for side chain input is showing up. Maybe something I have overlooked here..? Hi, please see the attached screenshot which demonstrates how to route a sidechain to Instant Phaser Mk II in Live. Thank you very much, works perfectly in Live now!